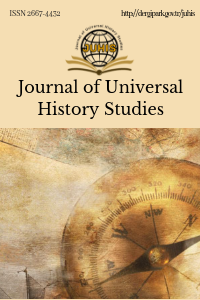 Journal of Universal History Studies (JUHIS): It is a scientific journal which is refereed journal and published in June and December twice a year. Besides scientific essays, it includes blurbs and reviews. In the journal, in the field of History, Art History, History of Religions, Historical Geography, Local and Oral History, International Relations (related to the history) studies are published. There is no charge for articles to be published in the journal. Essays which are sent to the journal will be taken under review after scanning similarity analyse. Similarity rate can be %30 maximum. The bibliographic information of the author(s) must be exluded from the paper for the first submission.